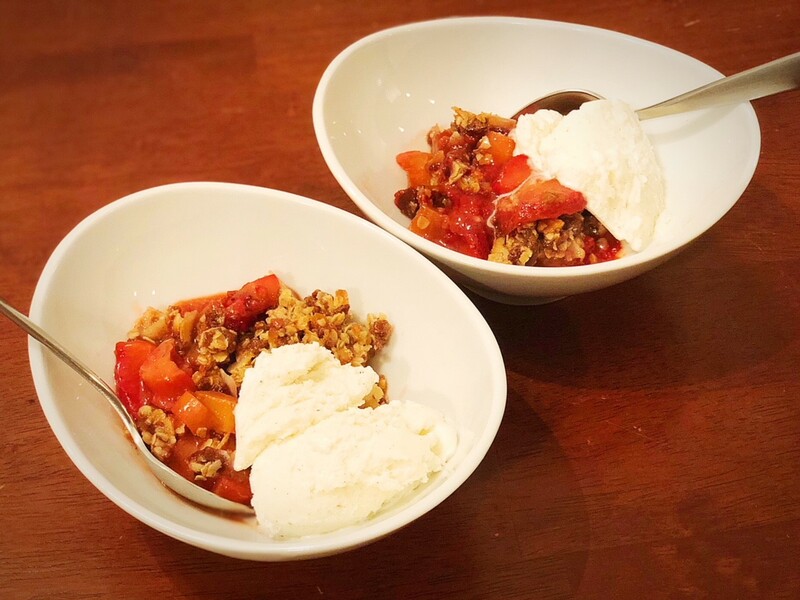 I’m lucky to live less than 2 miles from the State Farmers Market, and every time our North Carolina summers turn up the heat to stiffling, I know a cool, sweet reward will start to appear just down that road – juicy, tender summer peaches. I love wandering up and down the long aisle of the market, gently cradling the fuzzy orbs in my hands and bringing them up to my nose to see which peaches are fragrant and ripe. By the end of a trip, my fingers are sticky from grasping cut pieces of peach from each farmer to taste their harvest and make my selection for the day. 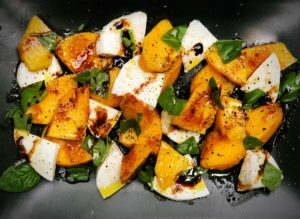 As a baker at heart, I certainly imagine turning those peaches into a pie or a crumble, but a couple years ago, I had a different idea – caprese salad, but replace the tomatoes with peaches! 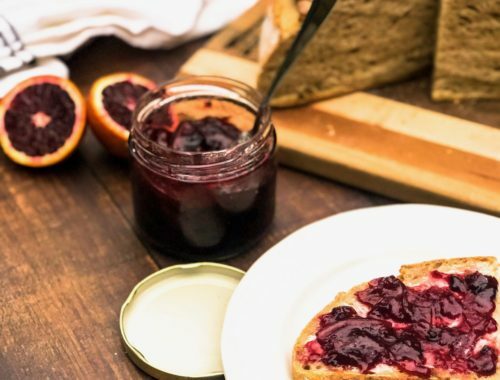 There’s an adage echoed by many a chef – “If it grows together, it goes together.” And it generally means that if a fruit or vegetable grows in a particular season, it’s easy to pair with other fruits and vegetables from within that season in a variety of dishes. But in this case, I figured “if it grows together, it can come off the bench and be the star for a while.” (Yeah, I know, that’s not as catchy.) In the height of summer, few things make me happier than bright red, ripe tomatoes pared with fresh mozzarella cheese, basil from my garden, olive oil, and the fancy balsamic vinegar I reserve just for that purpose. One of those things that might make me happier, is this scenario with sweet tender peaches in place of tomatoes. 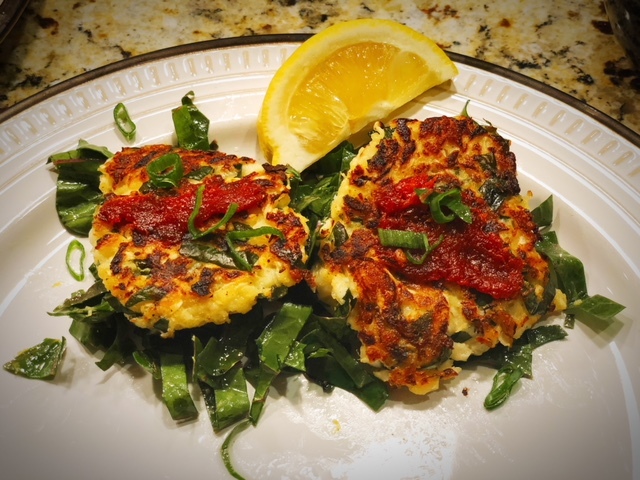 I like to make this as a special treat of a lunch, which is why this recipe is designed to serve one. Put you should absolutely double, triple or quadruple this and share with others if you’re so inclined. ** As with any cooking, use whatever you can afford, but a Caprese salad is a great time to splurge on the good stuff if you’re able. Nicer bottles of olive oil and aged balsamic vinegar will start at $15-20 a bottle and go upward in cost from there. Slice and cut the peach into small wedges. 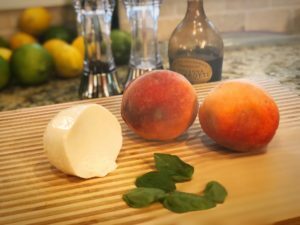 Slice and cut the fresh mozzarella into similar size wedges like the peaches. 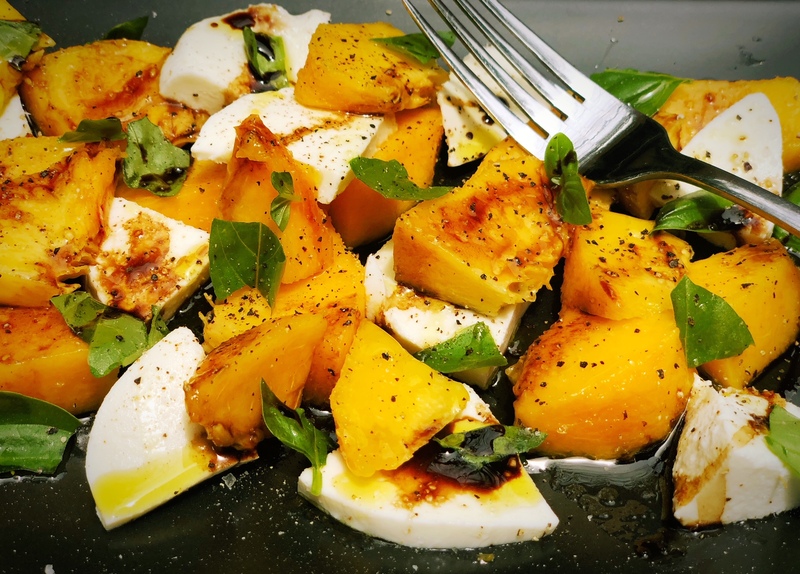 Toss the peaches, mozzarella and basil together in a bowl. Drizzle with olive oil and balsamic vinegar. Top with a turn or two of fresh ground salt and pepper. Enjoy!